The turtles are back in town. But this time, they've got a new coat of paint. 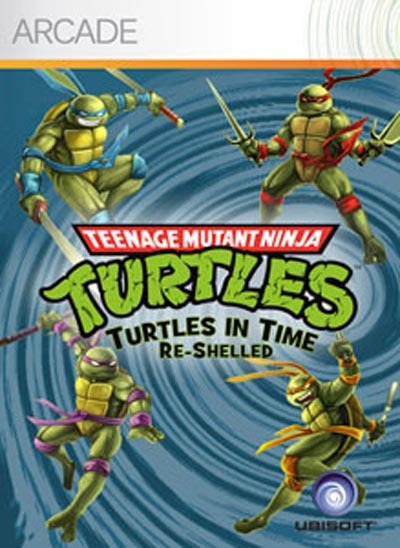 Yet another in the never ending series of old arcade remakes, TMNT: Turtles in Time Reshelled does it's best Bionic Commando Rearmed impression and falls short. They've gone back into the arcade version of Turtles in Time, not the superior SNES version, and covered everything in polygons. Sadly, that's just not enough to make an outdated type of game be fun. Anyone that played the 1989 arcade game that came out a while ago knows that it ran out of steam pretty quickly. It's fun not to think for a little while and just hit the X button, but it's not enough to carry the couple of hours that it takes. The same holds true with ReShelled. The big difference is that with the new graphics, you can attack in all directions around you. While it's a nice touch, it ultimately makes the game more confusing that it should be. Trying to re-train yourself to play with the new mechanic just feels weird. It doesn't help that there's a delay between your input and what you see on the screen. If you attack and then immediately hit jump, you have to wait for the attack animation to clear until they jump. And don't bother trying to jump immediately after you land, because it's a similar situation. That sort of quirk might work better with a full featured action game, but for a twitch beat-em-up, it just adds a level of unnecessary frustration to it. The graphics, while arguably better than the old sprites, are very bland. There's no cell shading to be found and the only thing in the game that looks like it has some pop to it is the turtles' colored bands. It seems like a missed opportunity to really evoke the nostalgia from playing it. Speaking of which, the game's music has been changed significantly, and for the worse. I still find the SNES game's soundtrack getting stuck in my head from time to time and when playing this game, I couldn't help but wait for my favorite song to come up. Instead, I got a bunch of generic techno type music that has none of the charm or fun that the original had. The only real good points is that the game includes a quick play option that allows you to pick any level you've beaten as well as saving your progress. It's a nice option when you only have 5 minutes to play a game and to have this kind of game actually save was a great surprise. But sadly that's not enough for me to recommend the title. Even though the price was dropped from $15 to $10, which was a great move by the way, unless you're a die hard fan of the Turtles and can't help it(like me), then you'll want to steer clear.